Sodium Tolerance Of Plants – What Are The Effects Of Sodium In Plants? Soil provides sodium in plants. There is a natural accumulation of sodium in soil from fertilizers, pesticides, run off from shallow salt-laden waters and the breakdown of minerals which release salt. Excess sodium in soil gets taken up by plant roots and can cause serious vitality problems in your garden. Let’s learn more about sodium in plants. The first question you need to answer is, what is sodium? Sodium is a mineral that is generally not needed in plants. A few varieties of plants need sodium to help concentrate carbon dioxide, but most plants use only a trace amount to promote metabolism. So where does all the salt come from? Sodium is found in many minerals and is released when they break down over time. The majority of sodium pockets in soil are from concentrated runoff of pesticides, fertilizers and other soil amendments. Fossil salt runoff is another cause of high salt content in soils. The sodium tolerance of plants is also tested in coastal areas with naturally salty ambient moisture and leaching from shorelines. The effects of sodium in plants are similar to those of exposure to drought. It’s important to note the sodium tolerance of your plants, especially if you live where groundwater run-off is high or in coastal regions where ocean spray drifts of salt to plants. The problem with excess salt in soil is the effects of sodium on plants. Too much salt can cause toxicity but more importantly it reacts on plant tissues just as it does on ours. 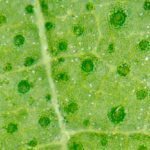 It produces an effect called osmotion, which causes important water in plant tissues to be diverted. Just as in our bodies, the effect causes tissues to dry out. In plants it can impair their ability to even uptake adequate moisture. Buildup of sodium in plants causes toxic levels that cause stunted growth and arrested cell development. Sodium in soil is measured by extracting the water in a laboratory, but you can just watch your plant for wilting and reduced growth. In areas prone to dryness and high concentrations of limestone, these signs are likely to indicate a high salt concentration in soil. Sodium in soil that is not at toxic levels can easily be leached out by flushing the soil with fresh water. This requires applying more water than the plant needs so the excess water leaches away the salt from the root zone. Another method is called artificial drainage and is combined with leaching. This gives the excess salt laden water a drainage area where water can collect and be disposed of. In commercial crops, farmers also use a method called managed accumulation. They create pits and drainage areas that funnel salty waters away from tender plant roots. The use of salt tolerant plants is also helpful in managing salty soils. They will gradually uptake sodium and absorb it.